Poppy-Rae, the baby girl of interest, is the first child of 20-year-old Jade Sparham and 21-year-old Liam Scaife. She was born in November, and her parents worked out that she was conceived on Valentine’s day. Scroll down for the whole story. Poppy-Rae, who is 12-weeks-old now, was born in November last year. Her parents later worked out that she was conceived on Valentine’s day. The birthmark appeared two days after her birth, and her parents became concerned as they thought it had something to do with her health. The doctor assured the parents that her health was fine. 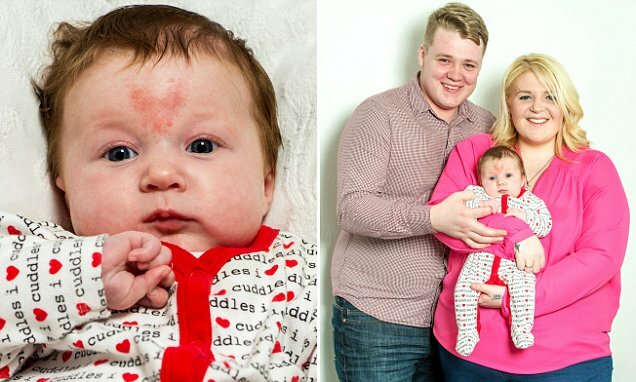 ‘I couldn’t believe when we spotted the heart on her head, especially after we worked out that she was conceived on Valentine’s Day last year. It was such a lovely coincidence,’ said Jade, the mother. The doctor said that it was a pressure mark and would fade away in a few hours. The mark stayed on her forehead, unlike as predicted by the doctor. The parents even noticed that the mark would become an angry red every time the baby llaughed or cried. ‘When I first noticed the mark on Poppy-Rae’s forehead turn bright red, I was a little concerned because I didn’t know what it meant,’ says Jade. They later realized that it’s a birthmark. Jade was worried that her daughter might have to face bullying or even struggle to find a boyfriend because of her birthmark. Jade and Liam, the parents of the baby, have now come to see their daughter’s look as unique and are beginning to do away with their fears. Poppy-Rae on the day of her birth wearing a pink babygro. The red mark on her forehead is also visible. Poppy-Rae is the apple of her parents eye, and they both love her a lot.